^ Louis Auguste Cézanne. Guarda-Mor, Edição de Publicações Multimédia Lda. [27 February 2007]. （原始内容存档于2007年3月29日）. ^ 4.0 4.1 Paul Cézanne Biography (1839–1906). Biography.com. [17 February 2007]. ^ Hoog, Michel. 第一章：少年和青年時代—艾克斯的中學生. 《塞尙：強大而孤獨》. 發現之旅. 38. 林志明/譯. 臺北: 時報文化. 1997年2月20日: 第14–15頁. ISBN 978-957-13-2240-7 （中文（台灣）‎）. ^ National Gallery of Art timeline, retrieved February 11, 2009. Nga.gov. [19 January 2011]. ^ Paul Cézanne quotes. ThinkExist.com Quotations. [17 February 2007]. 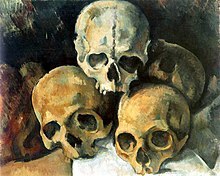 ^ Paul Cézanne 1839–1906. MyStudios.com. [18 February 2007]. Brion, Marcel. Cézanne. Thames and Hudson. 1974. ISBN 0-500-86004-1. Chun, Young-Paik. Melancholia and Cézanne's Portraits: Faces beyond the mirror. (编) Griselda Pollock (ed.). Psychoanalysis and the Image. Routledge. 2006. ISBN 1-4051-3461-5. Lehrer, Jonah. Paul Cézanne, The Process of Sight. (编) Jonah Lehrer. Proust Was a Neuroscientist. Houghton Mifflin Harcourt. 2007. ISBN 0-618-62010-9. Klingsor, Tristan. Cézanne. Paris: Rieder. 1923. Lindsay, Jack. Cézanne; his life and art. United States: New York Graphic Society. 1969. ISBN 0-8212-0340-1. OCLC 18027. Machotka, Pavel. Cézanne: Landscape into Art. United States: Yale University Press. 1996. ISBN 0-300-06701-1. OCLC 34558348. Pissarro, Joachim. 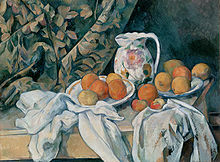 Cézanne & Pissarro Pioneering Modern Painting: 1865–1885. The Museum of Modern Art. 2005. ISBN 0-87070-184-3. Vollard, Ambroise. Cézanne. England: Courier Dover Publications. 1984. ISBN 0-486-24729-5. OCLC 10725645. Hoog, Michel. 《塞尙：強大而孤獨》. 發現之旅. 38. 林志明/譯. 臺北: 時報文化. 1997. ISBN 978-957-13-2240-7.